Fourty-six readers love this post. All You Need Is Love, Crazy Little Thing Called Love, Higher Love, Love Is A Battlefield, , Love Stinks, Can’t Help Falling In Love With you. Ok, I know you get the gist! Oh I nearly forgot one of my favorite movies. Love Actually! As we all know love can be the most wonderful feeling in the world but if and when you lose it … well…. It’s just heartbreaking. Love is definitely a wild journey. Full of thrills and excitement. Very unpredictable to say the least. The other year a good friend of mine Sherry Sadoff Hanck wrote a book of poems called Love’s Wild Journey: Poems From An Untamed Heart. I thought that would be a great name for a drink so I decided to create a cocktail dedicated to the wild journey of love and my dear friend Sherry. As we all know Valentine’s Day is coming up so it’s perfect timing for me to write about it. I wanted to start out with a spirit that would represent the goodness, purity and sweet part of love. Rhuby Rhubarb Liqueur is an all-natural rhubarb liqueur from Sweden. No additives or chemicals. A beautiful, balanced blend of rhubarb with vodka and bourbon vanilla bean. It’s a gorgeous shade of pink. Rhuby was created by Ylva Binder a female entrepreneur in Sweden who has a very inspiring story. Rhuby is just so delicious and the bottle is really beautiful as well. As I had mentioned the journey to love can be a bit rocky. So I chose to add New York Distilling Company’s Mister Katz’s Rock and Rye to my cocktail. Years ago rye was to harsh to drink on its own so rock candy was added to make it easier to imbibe. Mister Katz’s Rock and Rye has fruit and spice added to it as well. So although the journey of love the can have rough patches they can be smoothed out and you wind up with something wonderful! We all need a little spice in our love life right? So for that I added Domaine de Canton Ginger Liqueur. A romantic combination of baby ginger and cognac. Very aromatic and flavorful with just the right amount of spiciness and zest. Last but not least I add PAMA Pomegranate Liqueur. PAMA is made from natural pomegranate juice, tequila and vodka. Rich, luscious and a beautiful deep crimson red. Legend has it that the first pomegranate tree was planted by Aphrodite – The Goddess of Love. Eating pomegranates are supposed to give you a special allure .I’m sure drinking pomegranate juice does the same! Especially when it has a kick to it. In many cultures pomegranates are known as an aphrodisiac. So of course I had to add PAMA to my cocktail! All these liqueurs combine together for a delightful, romantic, beautiful looking cocktail. 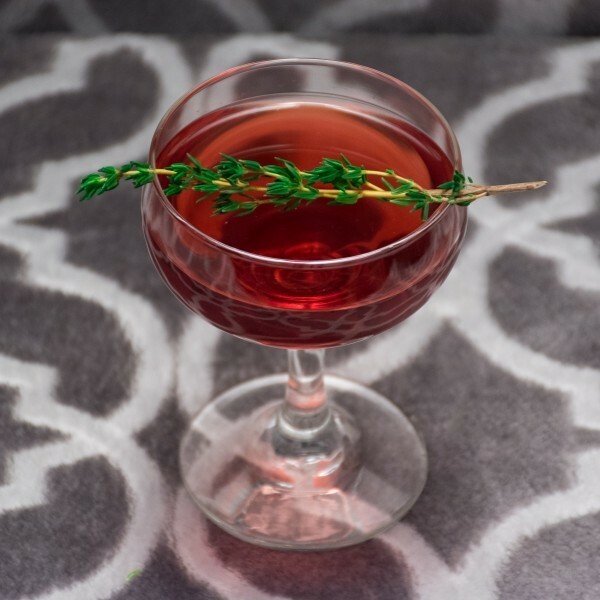 Last but not least I garnish my drink with a sprig of thyme. During the Middle Ages European women embroidered a sprig of thyme on tunics for their knights as a symbol of courage. I think it does take a bit of courage to fall in love! So let’s all toast to that wonderful, wild journey that we call love. A journey well worth taking! Let’s do it! Let’s fall In love! Cheers!